The member recitations might include work by local school students. The meeting held on February 27, 1904, declared a “leap year social,” included the reading by schoolteacher Margaret Woods of “seven original stories written by her pupils,” with the audience then selecting the winner, according to the Union. A replica of the original creamery building at the Sikes Adobe Historic Farmstead in Escondido will be dedicated on Wednesday, June 4 at 4 p.m. Free to the public. Events include ribbon-cutting, refreshments, tours and a sample of freshly churned butter. For further details email anne@sdrp.org or call 760-432-8318. The violin in his hands is a thing of life. His playing is always enchanting, developing new beauties, and never fails to hold his audience entranced to the end. The San Diego Union, writing about the playing of Robert Hargrave in 1908. Hargrave played in places like the International Order of Good Templars Hall in Poway and at halls and homes all over San Diego County. A week in 1901 found him playing at a ball in Oceanside on Thursday night and another in Valley Center on Friday. 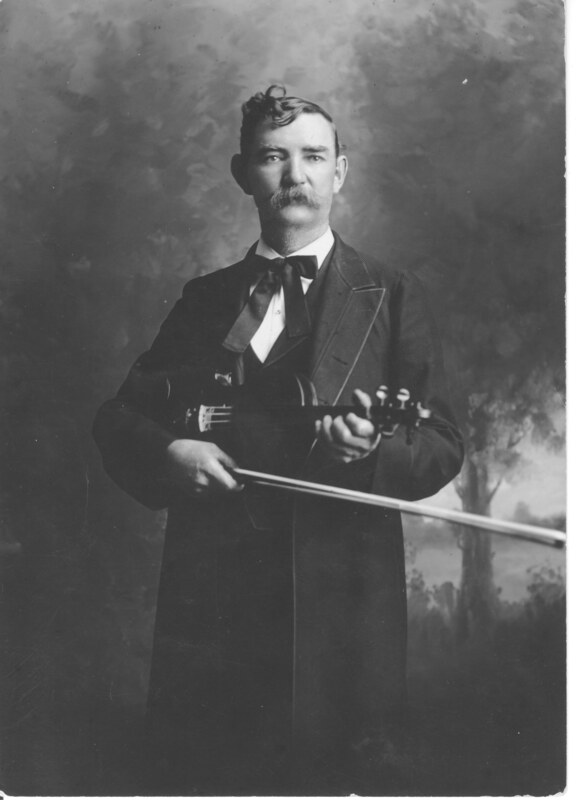 More than a fiddler, he was also acclaimed as a composer, music teacher and a band organizer / leader. So who was Robert Hargrave? For starters, he was a native Texan, born in 1858 in the town of Sulphur Bluff in northeast Texas. An 1895 souvenir booklet produced by a local paper, the Sulphur Springs Gazette, said his “childhood was a precocious one,” with Robert playing violin in ballrooms at the age of seven. In 1900 Hargrave, 41 years old, was living in Indian Territory (now Oklahoma) with his wife and two daughters and working as a music teacher. By 1901 he was back in San Diego County. He moved around southern California a great deal, perhaps reflecting the itinerant life of a musician in those days. Still, he left his mark on audiences and his fellow musicians. As late as 1917, he was posting newspaper ads offering music lessons from his residence at the Southern Hotel in San Bernardino. Robert Hargrave’s personal music ended with his death in San Bernardino County in 1923 at the age of 64. But he left a melodic legacy with fellow musicians, audiences and music students all over southern California. Sources for this post included historic San Diego and Texas newspapers, U.S. census records and the archives of the Poway Historical and Memorial Society. Rancho Bernardo Historical Society’s Speakers Series presents Dr. Ray Ashley of the Maritime Museum of San Diego on Wednesday, May 21 at 10 a.m. at the Rancho Bernardo Museum in the Bernardo Winery. Dr. Ashley will speak about the museum’s project to build a replica of the San Salvador, the galleon on which Cabrillo sailed into San Diego Bay in 1542. Free to the public. For further information on both events visit http://www.rbhistoricalsociety.org/ . 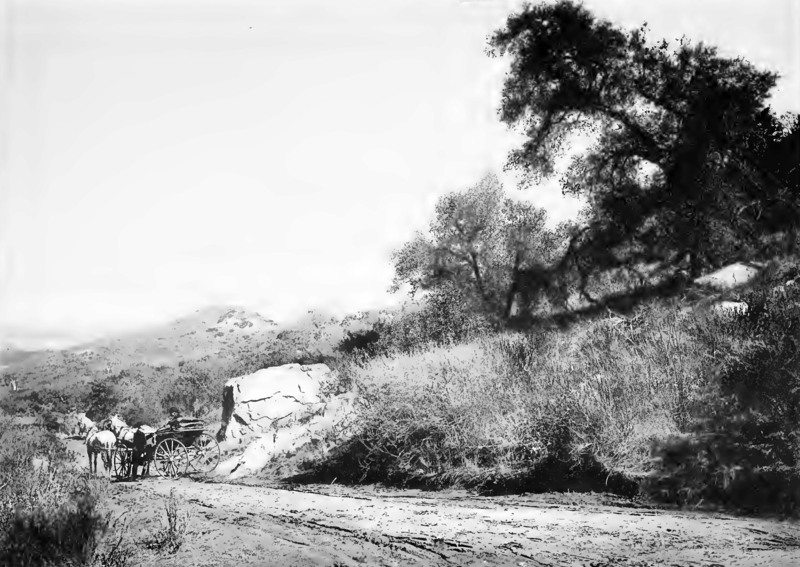 I began this blog back in January with a look at the 1887 book Picturesque San Diego, which offered fascinating verbal and visual impressions of San Diego County in a bygone era. I said I’d be returning to it periodically for its facts, impressions, and sometimes its contradictions. The book was written by Douglas Gunn, a former editor and publisher of The San Diego Union who was also a strong promoter of, and investor in, the development of San Diego. He hired a prominent Los Angeles-based photographer, Herve Friend, to work with him. Gunn began his narrative about the valley by referring to the name of its post office, which is the name by which we know the community today, Valley Center. Well, maybe not up to 1887, but a little over a decade later a drought would ravage the community. 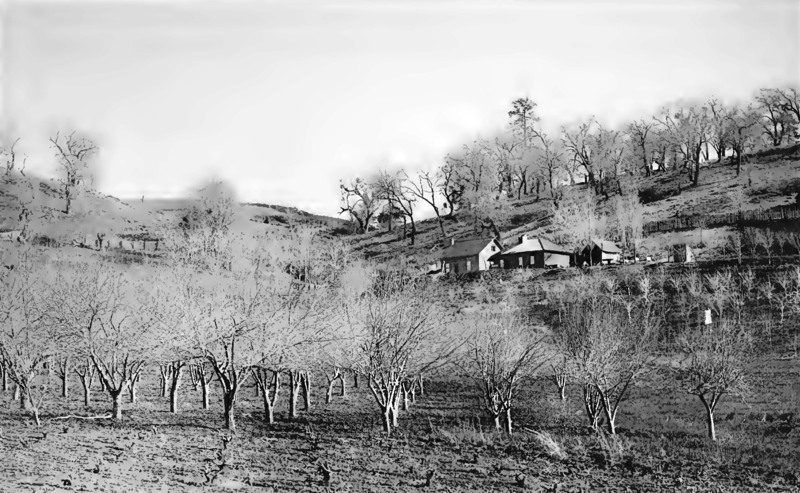 One resident, Abel Davis, in a memoir written many years later, told of how he and his siblings were among those who “saw no future in Valley Center farming,” and “began to scatter to other parts of the world.” In Abel Davis’ case, that meant Los Angeles and then Orange County. Gunn could get overly boosterish in some of his descriptions. Valley Center wasn’t the only area he claimed to be perpetually free from drought or bad weather. To be fair, his life was cut short before severe drought conditions came. And, he got some things very right. Rancho Bernardo Historical Society’s Speakers Series presents Dr. Ray Ashley of the Maritime Museum of San Diego on Wednesday, May 21 at 10 a.m. at the Rancho Bernardo Museum in the Bernardo Winery. Dr. Ashley will speak about the museum’s project to build a replica of the San Salvador, the galleon on which Cabrillo sailed into San Diego Bay in 1542. Free to the public. For further information visit http://www.rbhistoricalsociety.org/ . It’s for the San Diego, Cuyamaca and Eastern Railroad, one of a cluster of lines formed during an 1880s land boom in southern California. The road’s name indicates an ambitious goal of forging a rail link from San Diego to points east, specifically to join up with other railroads coming from the eastern United States. 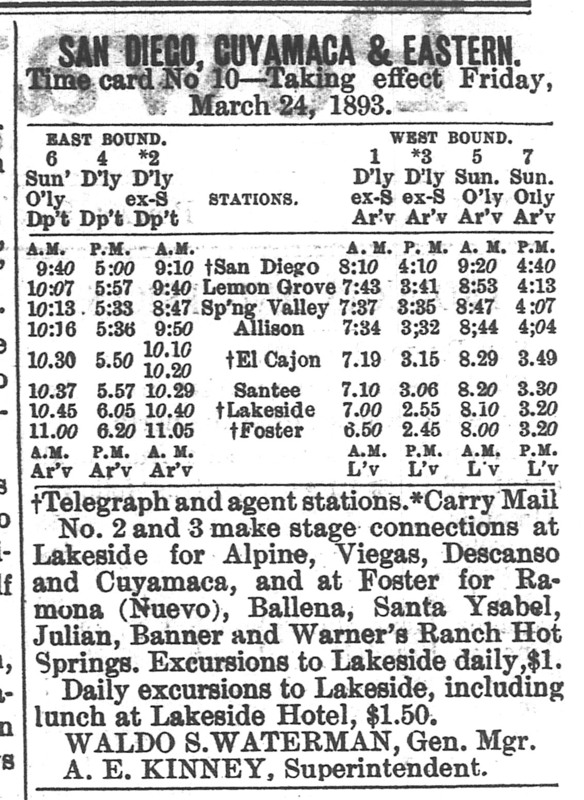 It turns out that eastern San Diego County was as far east as the SD, C & E ever got, but that’s a whole other story. For now, please note the station listed at the end of the line. Foster is another lost town from San Diego County history. Foster had its own railroad depot from 1889 to 1916, and its own post office from 1893 to 1916. There were a total of 40 people listed, with occupations ranging from ranchers and apiarists to a locomotive engineer, brakeman, quarryman and stonecutter. The town was situated on a ranch owned by Joseph Foster, the only resident whose listing is in boldface and all caps. 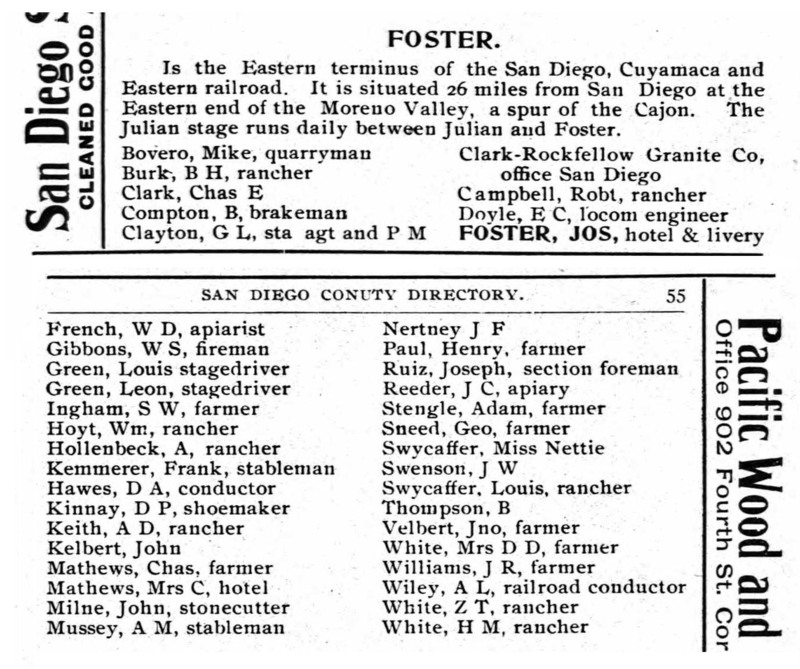 In addition to being a rancher and hotel owner, Foster also was co-proprietor of a stagecoach line. People disembarking from the train at Foster could ride the stage on to Ramona, Ballena (now part of Ramona), Warner Springs and Julian. Farming, railroading and quarrying made Foster a busy place, and a noisy one too. The quarries were a source of rock for construction. And they were almost the little town’s undoing in 1904. “People at Foster, a quarrying town at the end of the S.D., C. & E railway, twenty-five miles northeast of this city, had a hard battle with brush fires early yesterday morning,” reported the San Diego Union of October 27, 1904. The entire town’s population turned out en masse to fight the fires which came within two hundred feet of the railroad depot and hotel, wrote the Union. Their efforts, aided by a change in the wind, saved the town. The great San Diego County flood of 1916 wiped out the railroad line to Foster, never to be rebuilt. The flood also sounded the death knell for the post office. The Foster townsite is today at the foot of the San Vicente Dam and is considered part of Lakeside. The area is presumably much quieter now than in what might be called its noisier, and potentially explosive, heyday. Sources for this post included historic San Diego and Poway newspapers, the website of the Lakeside Historical Society, and the book, Ramona and Roundabout, by Charles R. LeMenager. Explore 10,000 years of history at the San Diego Archaeological Center. The center’s museum offers changing exhibits and hands-on activities revealing San Diego County history through the archaeological record, from the earliest Native American residents through the many immigrants and groups which followed. For more info visit http://www.sandiegoarchaeology.org/ . The San Marcos Historical Society offers a variety of programs for elementary students. Tours and activities are designed to fit the grade level of the students participating. For more information call 760-744-9025.